This was as auspicious a day as London has seen for decades, a new arts complex with two concert halls, art galleries, and welcoming public spaces with cafe and restaurant - all in the middle of an eye catching new commercial building behind Kings Cross Station and alongside a picturesque canal basin. It is fitting that we take our first illustration from today's Metro, which celebrates today "the most extraordinary shake-up of London's classical music scene in decades" and highlights the achieved vision "capitalism directly supporting culture" of Peter Millican brought to fruition with architects Jeremy Dixon and Edward Jones. For Musical Pointers, the Endymion Ensemble - which we have supported ever since their Residency at Blackheath Halls - was a perfect choice to be openers in this showcase of 100 three-quarter hour events spread over five days, and to have been invited to return soon for a weekly residence at Kings Place, one of the most gratifying performance spaces they can ever have known. We heard four contrasting works, which I shall note in reverse order. Schoenberg's 1st Chamber Symphony - a "party piece" of London Sinfonietta, which has opted for Kings Place as its new home - can be one of the most unsettling works to listen to because of its density. 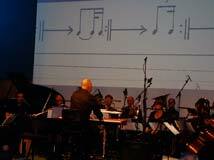 It is no easier in Webern's reduced version, and might have benefitted from a conductor to balance the parts shared between piano trio and two winds, flute and clarinet. York Bowen (the York Bowen Society has been re-launched) is enjoying something of a revival just now; but his exuberant music (often overbalanced with virtuosic piano parts for the composer-pianist himself) needs careful vetting; the piano trio Op 118, mercifully not overlong, is not one of his best chamber works. Thomas Dunhill's charming Quintet Op 3 was another matter; here the indefatigable violinist and pianist (who had no rest throughout) were joined by horn and clarinet - a felicitous combination which was perfectly balanced by the artists. It starts with a variations movement and emounts towards the end with a grandiloquent peroration, but has many delights to offer on the way and certainly convinces that this uncommon chamber combination is one that today's composers might well explore? First, and best to remember, was their account of the extraordinary Ligeti horn trio, subtitled Hommage to Brahms, and pure Ligeti at his most fascinating. At Blackheath Sunday Mornings recently they had given those two composers' horn trios in tandem with tremendous success, completely winning over the conservative audience there. The new Hall One at Kings Place, built in a low basement to exclude traffic sound, has marvellous acoustics - researched by Dixon Jones and Arup's acousticians in a dozen Japanese concert halls - warm and clear, variable for classical and other musics as well as for speech, and practically free of such intrusive sounds as compromise listening satisfaction in so many halls. 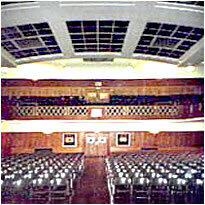 Londoners are sure to flock to a venue which is one of the most functional and attractive in the Capital. Other events in this week's festival will be added and readers are advised to get there before too many of the remaining concerts are sold out ! Photos: Metro (Eammonn McCabe) and "thisislondon"
This history of the violin sonata series (we missed Handel to Schubert at 9.30 a.m.!) began disconcertingly with some rough violin playing in Schumann's Op 105. But veteran Peter Cropper soon settled and during the morning, in three 45-minutes sessions, was to be heard some of the most intensely expressive and musical duo playing encountered for a long time. 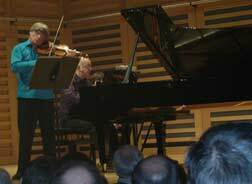 The last time we had heard Cropper was with his Lindsay String Quartet, shortly before they disbanded, at the London Chamber Music Society Sunday Series at Conway Hall, Red Lion Square. 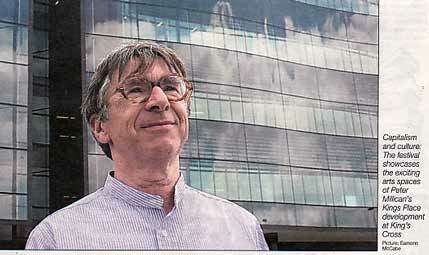 Peter Cropper introduced each item and drew on his vast performing and teaching experience, lamenting the primacy for "correctness" of his students. 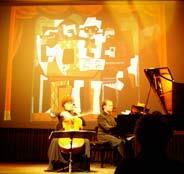 This duo, who play regularly together, are well attuned. Ending with the unduly neglected 1st Prokofiev sonata (for Cropper a towering masterpiece of the genre) he joked that the piano was bigger than the violin, making for unfair competition, but at Kings Place there was no balance problem. The sound was wonderfully focussed and clear, equally so the spoken introductions without recourse to microphones (see later !). My only caveat was that Martin Roscoe was not brought into the dialogue. The performances were deeply insightful and most of us would have been encouraged to attend a full version of their History of the Violin Sonata, which would require three full length recitals. A last sampling of the opening festival's 100 events was a Saturday afternoon, October 4th, spent in the company of three pairs of younger, but firmly established, duos in three 45-mins recitals. These were curated by Colin Matthews, who introduced them for Radio 3 future broadcasts. Matthews has been engaged already in recording at Kings Place Hall One (100 songs commissioned for NMC's 20 years celebration) and his placing of Schumann and Britten alongside little known examples of his own music made for three riveting sessions, which I heard in three different locations in the hall. 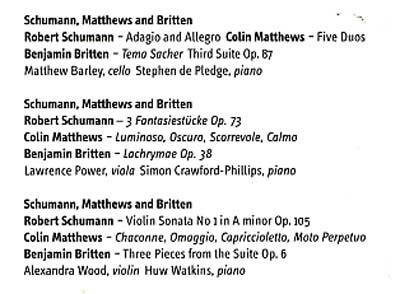 Perhaps most memorable of all was the fire which Alexandra Wood and Huw Watkins brought to several of Matthews' gift pieces and to movements of Britten's early duo, which on this hearing sounds to have become under-rated. 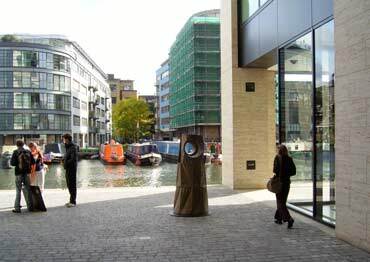 Beforehand, time allowed for lunch (good catering, less expensive than South Bank Centre) and exploration of the building inside and out - a walk along the tow-path across the canal was a special pleasure. This weekend of 100 concerts and associated events in three days was the second of what promises to be an annual autumn festival. One of my colleagues who planned to share Musical Pointers' coverage was unable to attend because of an accident, therefore it was left to the Editor to sample nine of the concerts. Peter Cropper with Martin Roscoe [pictured above] returned to tackle Schubert & Brahms, a year on but still in great form as a long term partnership in perfect accord. Schubert's A minor sonatina emerged as more substantial than its diminutive titling can suggest. The Brahms sonata in A has always been a favourite, its amabile opening characterising the warmth of the whole; an inspired account, with faultless intonation and expressive subtley, the pianissimos and pizzicatos enhanced by the contribution of Hall One's acoustic and silent ambience. By contrast, Muziké (J-B Pommier & colleagues) also representing older generations, disappointed in a routine account of Mozart's Eb piano quartet. 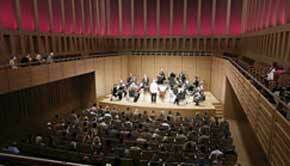 Two cello concerts will dominate my memories of the weekend. On the Friday, Christoph Richter curated Mendelssohn Plus - a strenuous morning, of which I caught the second and third of their concerts. His accounts, with London-based pianist Nicola Eimer, of sonatas by Mendelssohn (Bb, Op 45) and Brahms (F, op 99) prompted revaluation of two major, but unfavourite, works of mine in the repertoire. Richter is a sterling player, unassuming in manner, strong and authoritative. The Mendelssohn had always seemed to me to have too many notes in the piano part, and the Brahms a vehemence which made the cello to struggle against an overwhelming piano part. His young partner however, playing continuously through the morning, with only brief pauses from 9.30 to 12.45, made light of the work and contributed to exceptional duo playing, a real joy. (Peter Sheppard in his concerts always makes the point that his pianists have far more notes to play than any of the other musicians, so it is Eimer's photo [L] that I offer.) Songs from Schumann's Liederkreis and a group by Brahms were provided by Andrew Tortoise, with impeccable intonation and poise, his tone quality a little dry (think of Aksel Schiotz) but warming by the end of his last set. On Sunday morning another cellist had an endurance stint from 9.45 to 1 pm; Xenia Jankovic, Serbian-Russian, based in Germany. 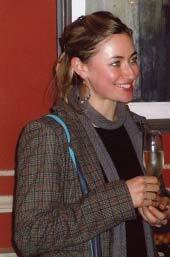 A masterful recitalist, with expressive facial expression and gestures that brought to mind the famous picture of Suggia in the Tate, she brought an unique approach to Stravinsky and Prokofiev, with artwork projected in association with Cedric Vasic. 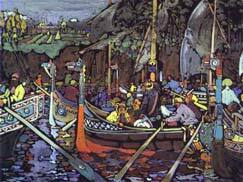 For Prokofiev's cello sonata we had Kandinsky's picture of a festival on the Volga to enjoy, but more spectacularly Stravinsky's Suite Itallienne was given with Picasso commedia del arte images of Pulcinella etc [illustrated R], projected in computer-controlled perfect synchrony to the music. Delicious. And Jancovic's pianist Nemad Lecic too must be mentioned; self effacing, but in commanding control of his parts, even though hampered a little in Hall Two by a less than full-sized piano. A great recital; I look forward to hearing these two cellists again as soon as possible (husband and wife, so I learnt in passing) - they can both be heard in cello concertos by Klengel on cpo). And in the St Pancras Room Twisted Lounge's Sinister Resonance sought to explore 'the Uncanny' very solemnly with two ancient horn-gramophones, one of which fell apart during the session and had to be reassembled. All very weird and unwonderful. To finish, a concert of music for the Horn curated by Colin Matthews, who supplied a piquant brand new two-minute Tanglewood Fanfare for Richard Watkins, with piano resonances. * With his brother Huw Watkins it was given twice "because composers have difficulty in achieving second performances"... Not so surely for that piece, which should become an established starter or encore favourite very soon. Watkins reclaimed for the horn's small repertoire Schumann's Adagio and Allegro, which has been taken over by many other instruments, and he contributed to an outstanding performance of Britten's chilling Sitwell setting Canticle III 'Still Falls the rain" with tenor Daniel Norman and Huw Watkins, the acoustic of the hall making its own very positive contribution to the experience. 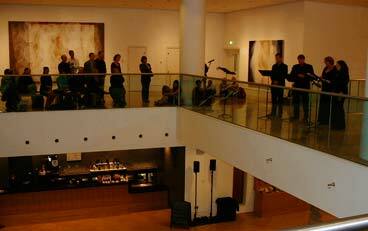 As well as all that, extras included appearances in the gallery of Kings Place's Atrium, at intervals through the day, of Edward Wickham's marvellous The Clerks vocal ensemble, giving new audiences experiences of very old music from their special repertoire. The whole weekend was a triumph of organisation and bids fair to become a notable fixture of London's summer festivals scene. Members of the Classical Opera Company were “in residence” at Kings Place on Saturday afternoon, giving a series of three easy to digest recitals variously titled as Mozart’s Burnt Love Letter, Haydn’s Piercing Eyes, and Beethoven’s Kiss. In each concert the same three young singers were accompanied by Gary Cooper [R], one of today’s leading exponents of the fortepiano, allowing the audience to hear these songs much as they would have sounded in their composers’ lifetimes. It was a relaxed affair, seemingly quite spontaneous, with the singers at least to some extent sight reading from their scores. The audience was equally relaxed, heads and hands swaying in time with the tune; some obviously experiencing this type of music for the first time, and finding they enjoyed it. The jewel at the centre of the afternoon was a fine performance of Haydn’s Arianna a Naxos, sung from memory by the Icelandic mezzo soprano Sigridur Osk Kristjansdottir[L]. For those who don’t know this work, it recounts Arianna’s tale in her own words. She wakes, surprised to find that her lover is no longer at her side, her confusion turns to panic and grief, then she sees Theseus at the prow of his ship sailing fast away and she realises that she has been abandoned on the island of Naxos. It is written in the form of a miniature cantata, with recitative and aria sections alternating and requires the singer to mirror Arianna’s ever changing emotional reactions in the colour of the voice. This was as good a performance as I have heard, temperamentally mature, yet softened by a youthful voice. Later in the afternoon Thomas Hobbs [L] gave a persuasive account of Beethoven’s An die ferne Geliebte, which would have been even better if he had had the courage to trust himself without the score, and address it directly to his audience. Sophie Bevan [R], a soprano who has become something of a regular at Kings Place, completed the line up and contributed a number of well judged songs in her customary polished way.